Countries all over the world are noticeably seen to be suffering different problems which includes economical, environmental, technological and many others. With the presence of these problems not only the credibility of the country was affected but also the people who are living in it. People are the ones who are greatly affected since they are the suffering all the consequences that is brought by all problems in their country. One of the major problems that countries all over the world are facing is the continuous price increase of all the commodities. As said earlier all the consequences brought by these will be carried by the people, hence as of today huge number of people are suffering from hunger. Hunger is one of the problems of the government since it keeps on increasing as the years goes by. To the extent that every country wanted to track how much was being affected by this alarming incident they are able to design a tool called Global Hunger Index (GHI). It is a very essential tool that can be used by government officials in measuring the extent of hunger problems in their place. This GHI can be used by people in every region of the country, the country as a whole as well as globally. For people who are not aware on how this GHI can track down hunger problems in a specified place, all they need to do is to make a computation with the average percentage of people living in the place. Then, from the totality of the people get the percentage of the population those who are considered to be undernourished. They need also to track down those children who are whose age is 5 years old and below who are underweight as well as those who are dying before turning into 5 years old. All the calculations that you are going to do should be based on the range of 100 points, zero will be the highest and 100 would be the worst. For those countries who have tried to use this GHI in tracking hunger problems in their place, they can already figure out where their country should belong. Year 2013 recorded ten countries which can be considered as the hungriest countries all over the world. Burundi was recorded to be the first having 38.8% which is considered to be extremely alarming case of hunger incidents which followed by the Eritrea with 35.0% and the third is the Comoros having 33.6%. These three countries are considered to be having an extreme suffering to hunger that needs to be taken an immediate action. Timor-Leste as well as Sudan, Chad, Yemen is considered to have just average cases of hunger. The last three countries are considered to be the Ethiopia, Madagascar, as well as the Zambia which is known to be the last in the list having just 24.1% of hunger problems in their place. 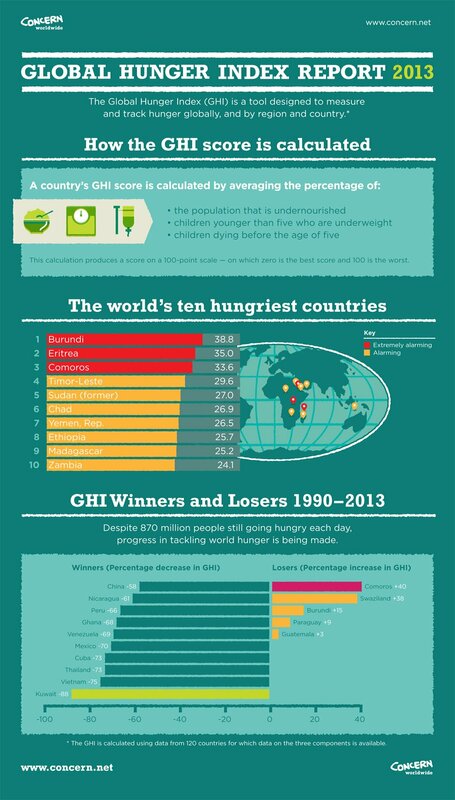 To help people figure out what was the development of the GHI from the year 1990 up to 2013, they are able to categorized countries which overcome hunger problems and those who have loss. These records are being calculated from 20 countries all over the world. With regards to the countries which won in overcoming the problem China, Nicaragua and Peru is on its top spot while those who failed is the Comoros, Swaziland and Burundi. The fact that they need to be aware of this problem, every country are really making their best as to how they can be able to refrain and avoid the occurrence of this alarming incident. They are now giving enough attention to those people who are exposed in huger to be given immediate response to their needs. Hunger problems are very dangerous that it may cause loss of life; hence people need to be responsible on how they are going to prevent this to happen.